The Taj Mahal is everything India is not. Slowly, I open my eyes. Interruptions to my sleep are frequent, usually the consequence of Grover suddenly slamming the brakes, or his persistent honking. But we haven’t stopped, and the road seems clear. Grover seems unbothered by the fact that all four of his young American clients have succumbed to fatigue during the five hour drive from Delhi to Agra. The engine to the small white Tata Indigo gently hums as we coast across India. Sweat drips from my hairline, down the surface of my cheek, and disappears somewhere behind my ear. Despite the hot midday temperatures, the dusty road prevents us from rolling down our windows, and I am too shy to ask if Grover has air conditioning. Since I am the only one who’s awake, the car will remain silent save for the Bollywood musical soundtrack playing softly in the background. If the others wake, conversation will ensue where it left off before we, worn down by the heat and the overpowering intensity of a landscape so utterly different from anything we had ever imagined, all fell asleep. There is nothing to do but look out the window, through the glass, at India. The land we’ve been travelling through has mostly been flat and dry, painted with various shades of orange and brown. Since no trees can grow in such harsh conditions, the blue sky, which carries the unforgiving rays from the sun, drops straight from the heavens to hit the ground like an ungraceful thud. The road winds through farmlands. Stretching as far as I can see, the image of India is speckled by the blues and pinks and oranges of the saris of women who are working the fields. Closer to the road, I spot a “squatter,” a man stopping his work to relieve himself. When he’s done, he stands up and continues to labor. Dome-shaped straw huts form a little neighborhood right in the middle of the field. We drive right through. My three friends and I met Grover in a Delhi hostel the day before. We had just flown in from Chennai, and, without plans, we were looking for a way to get to Agra, the site of the famed Taj Mahal. We asked the man behind the front desk at the hostel if he knew the best way to get there. He pointed to a man dressed in all blue, who was sitting at the hostel’s modest restaurant eating a meal. 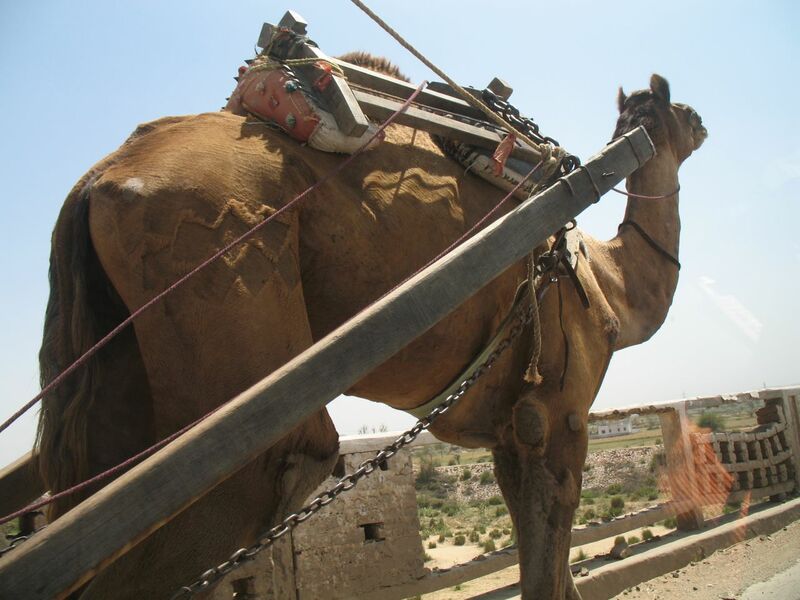 Grover promised to take us to the best sites in northern India for a bargain price of $50 a person. “You have a week?” he asked. “We have three days,” we replied. By that time, I had already made a game out of staying clean in India. When I first stepped onto Indian soil, I was bombarded by the air, which was thick with a smell that could only be described as a combination of a small zoo and rotting eggs. Toilets and showers were nonexistent; I learned to take Pepto before meals to minimize my bathroom visits and to wash my hair using a water bottle, keeping it in tight braids between “showers” to prevent it from looking too greasy. Each night I made sure to blow my nose to free it from the black gunk that would build in my nasal cavities and to wipe out my ears with Q-tips, which undoubtedly would yield the same black discharge. 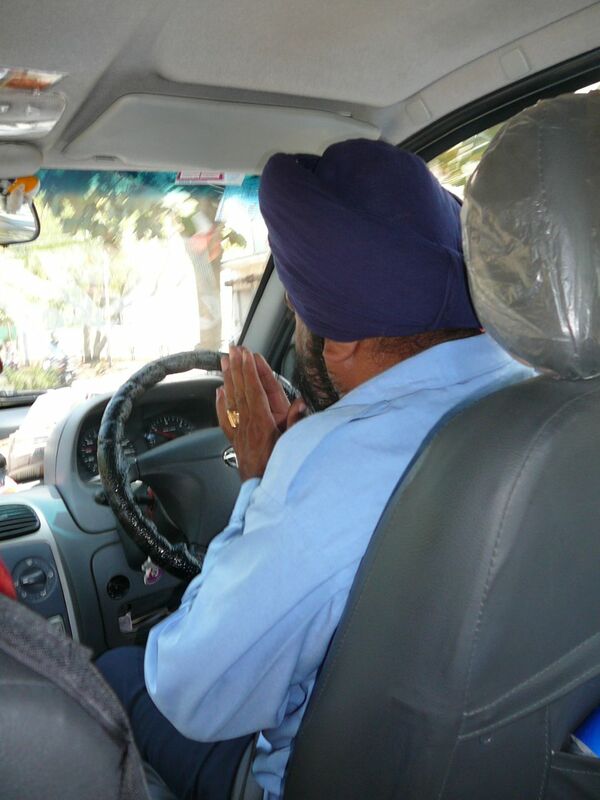 “I will show you the love of my India,” Grover said. So what is the Taj Mahal doing in India? The Taj Mahal, in a word, is beautiful. It is an example of the most immaculate architecture ever completed. 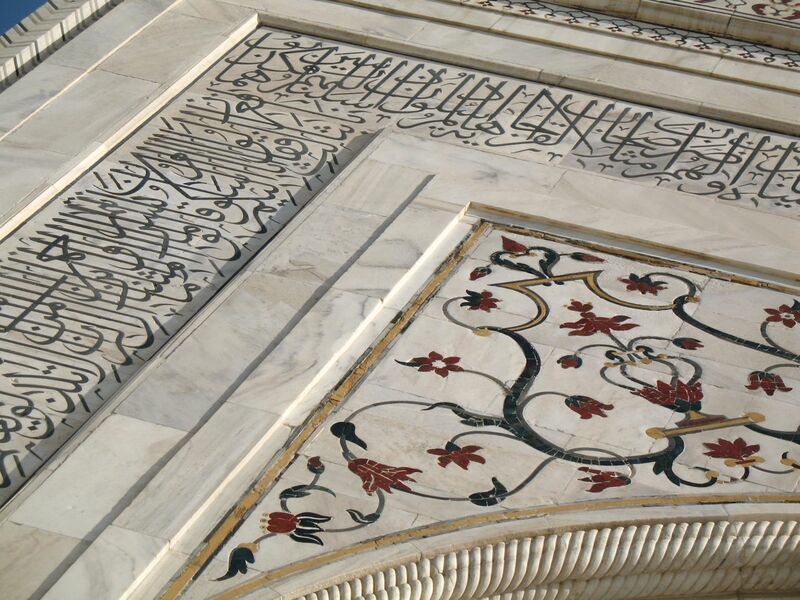 The entire estate is exactly symmetrical; the intricate, ornate calligraphy is mirrored exactly on both sides of the main building. 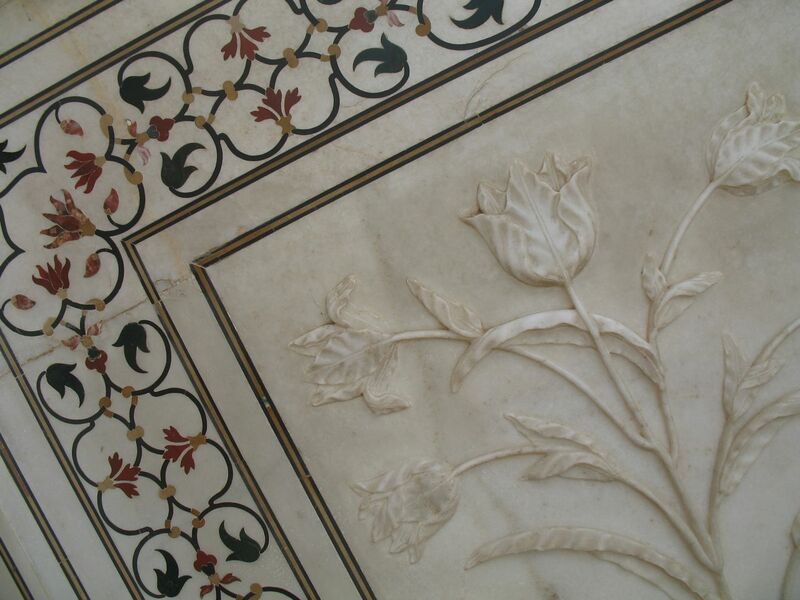 Hand-carved marble flowers that crawl up the left side have perfect mates on the right side. 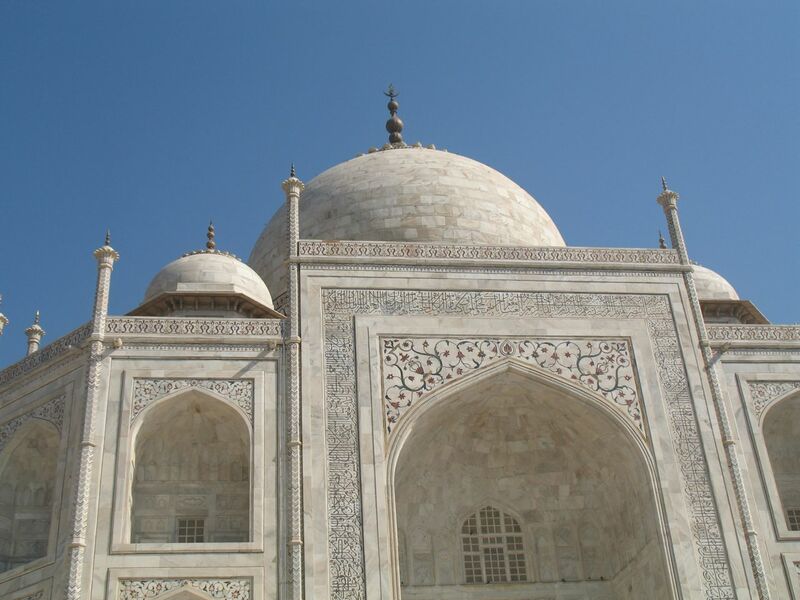 But perhaps the most striking feature of the Taj Mahal is its color. It is pristine. It is white. Nothing in India is white. Nothing in India is clean. 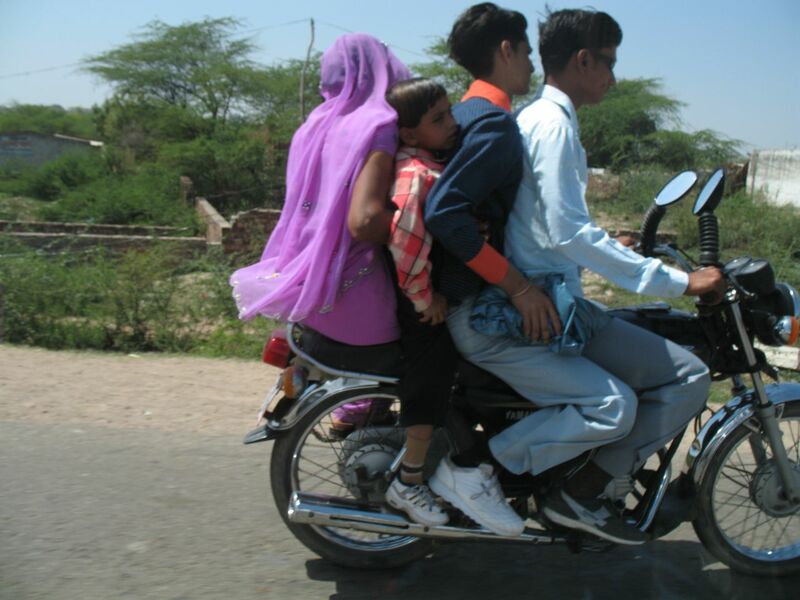 Nothing in India is smooth or pure or opulent. I spend a few minutes trying to remedy my experiences in India thus far with the sight right before my eyes. If my own boogers can not survive a day in India without turning black, how does the Taj Mahal not succumb to India? 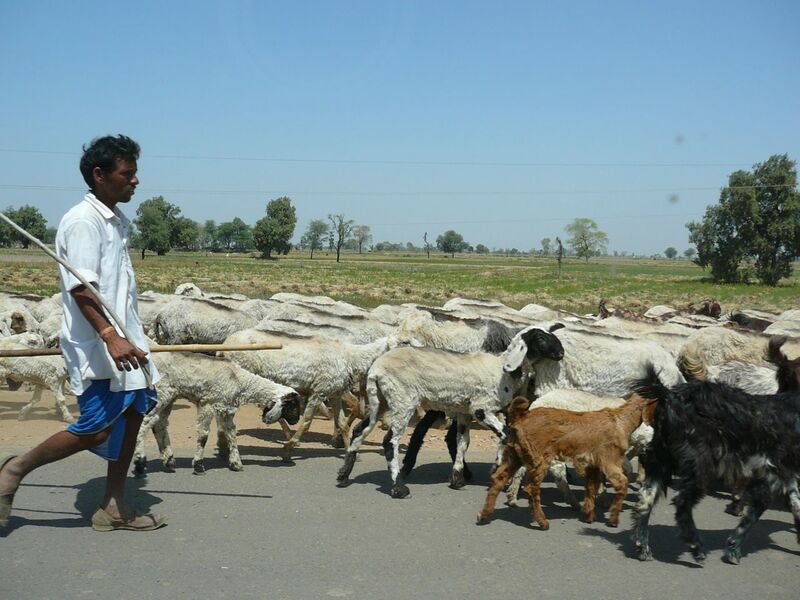 Where are the roaming cows and the barefoot children? Where are the brilliant sparkling colors that even the poorest women working in the fields of rural India display in their saris? Such careful pursuit of white marble exquisiteness seems like it belongs somewhere in the Greco-Roman tradition, or at the very least, a museum where it can be protected under the watchful eyes of security guards. So what is the Taj Mahal doing in India? I spend the rest of the day exploring the grounds and taking pictures of the Taj Mahal from every angle. I am unsure that I will ever be in the presence of such splendor ever again so I attempt to preserve my memories through the lens of my camera. I look back at my pictures later and realize that I asked myself the wrong question. 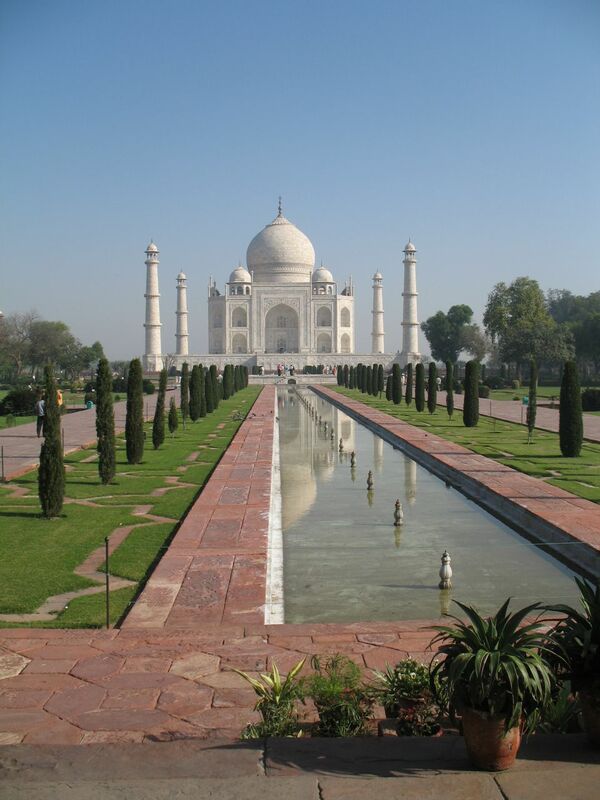 The Taj Mahal is a mausoleum, built by the emperor Shah Jahan for his wife Mumtaz Mahal. It is a monument of love. In fact, the only element of the estate that is not symmetrical is the tomb of Shah Jahan, who was placed beside his wife (who lies in the absolute center of the monument). That is the magic of the Taj Mahal. And of India. 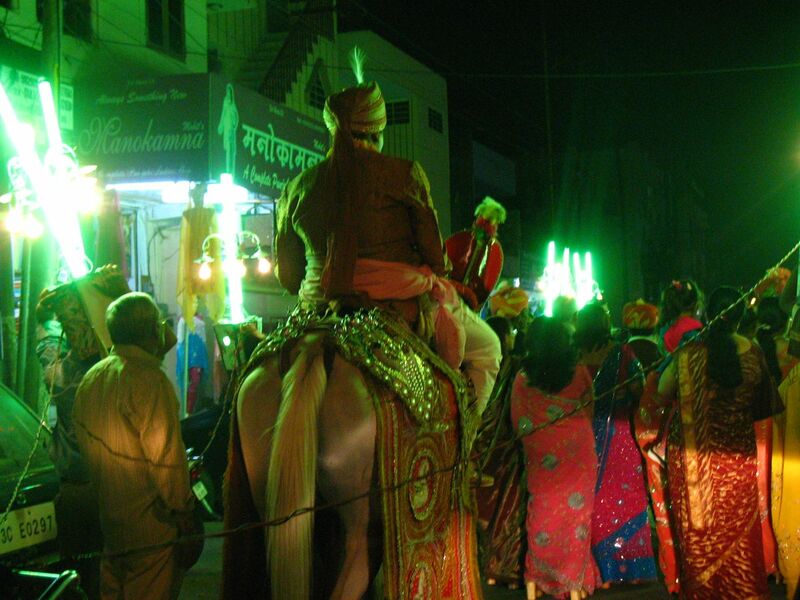 Later in our travels, we stumble upon a wedding parade in Jaipur. The groom, riding a lavishly decorated white horse, was treated to the exuberant dances and intoxicating beats of his family. The celebration clogs the streets, but people don’t seem to mind. The cars that drive by honk, but not out of anger or frustration. They honk in congratulations. A crowd of bystanders gather to watch the parade on the sidewalk. Mothers keep a close watch on their children, who can’t resist approaching the four of us, the obvious outsiders. They giggle and smile shyly and are delighted when we take pictures of them. There is a sense of community in the air, and even though the dances aren’t perfectly coordinated, and the drumbeats aren’t perfectly in synch; even though there isn’t anything remarkably opulent about the occasion, the festivities honor love. “No, no! I couldn’t!” I reply, not only because I haven’t owned a cassette tape player since I was ten years old. I am simply amazed at the generosity in the gesture. And just then, I realize it. 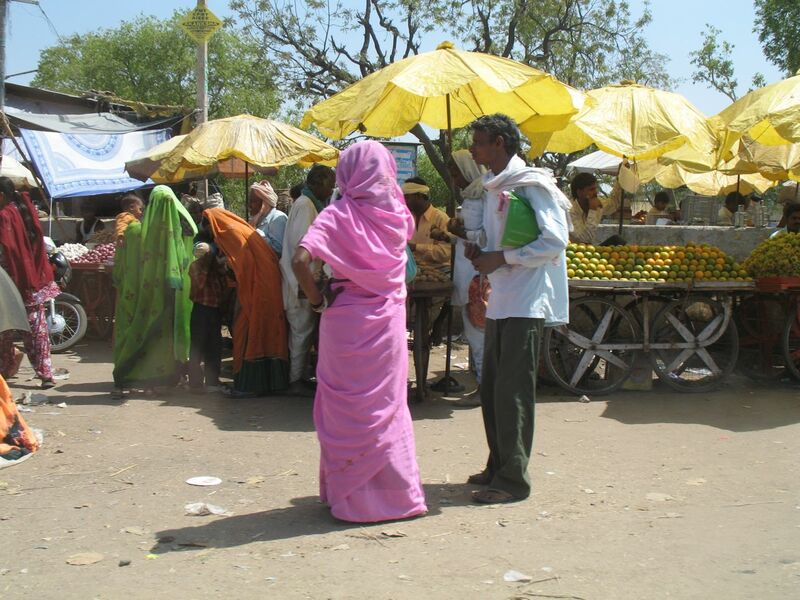 Despite the dirt and the sweat, the smell and the heat, I, in fact, love India in that genuine, (albeit) flawed way. This post, dedicated to Grover. Beautiful pictures of the Taj Mahal. Having been there myself, I am wondering how you were able to take your camera onto the grounds? They would not let us take cameras. 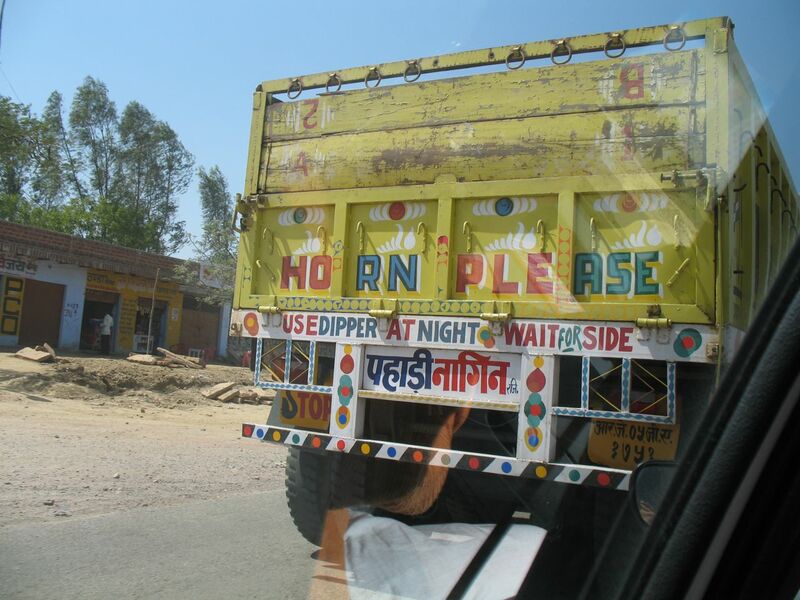 I toured India in 2007, so I don’t know if the rules have changed since then. I just looked it up on Wikitravel: http://wikitravel.org/en/Taj_Mahal#b and these rules seem to be the same as when I was there. We were allowed to take our cameras inside the park, but photography was/is not allowed inside the mausoleum, where the tombs are located. I wonder if there was a miscommunication somewhere? I hope you still enjoyed your experience! at the risk of sounding like i am butting in a conversation….